Visit a Niagara Falls waterpark to get all-weather fun for the family. This exciting water-themed indoor amusement has enough activities to tire out your energetic young one. This waterpark at Niagara Falls includes 16 waterslides and plenty of splashing water that gives you the excitement of the thrill of the famous falls, but in the heated indoors. Hot springs and wave pools create unique fun where you and the kids can ride along with the rushing water on inflatable tubes. The waterpark is only two minutes away from the falls and it could easily occupy your family for an entire day on your vacation. 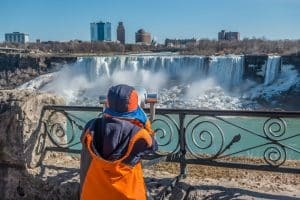 A day at the Niagara Falls waterpark will give your kids plenty to tell their friends about when they get home and provide them with a uniquely fun activity to complement their experience of seeing the famous Niagara Falls. There are many ways to see the falls, but by far the best views come from being on a boat that travels right into the spray of the tumbling waterfall. This is a very good choice for families with small children because kids 4 years old and under get on the trip for free. The Hornblower Niagara Cruises depart every 15 minutes during the day and there are also nighttime cruises to see the falls illuminated. Your kids aged 5 to 12 get a cheaper admission price and you can buy a discounted combination ticket that includes a daytime cruise and a nighttime trip to see fireworks over the falls. Daytime cruises run from April 7 to November 30 and the nighttime illumination cruises operate May 11 to October 27. The fireworks cruises are available on selected dates from May to October. The waterpark at Niagara Falls isn’t your only water-based entertainment option for your family-friendly vacation. Marineland has real life whales, dolphins, and other marine mammals for your kids to see plus a whole lot of exciting rides. Although many of the rides are more suitable for older children and adults, there are also rides that small kids will enjoy and some that you can all ride on together. This outdoor park is a summer destination and will give you the opportunity to show your kids some natural wonders and experience nerve-tingling thrill rides all in one trip. Clifton Hill is an entertainment complex just a few blocks away from the famous Horseshoe Falls. One of the great attractions of this site is it amazing Niagara Skywheel. This huge Ferris wheel stands 175 feet tall and affords fantastic views of the waterfalls. The area includes some bargain eating options including all the fast food brands that kids love. Clifton Hill provides evening entertainment options as well, including a bowling alley, a theatre, and a wax museum. So, there are plenty of options to combine other experiences with your trip to the waterpark in Niagara Falls. Skylon Tower gives you another safe fallsview option that you can combine with a great family meal in a revolving restaurant. The Skylon Tower includes two restaurants about 775 feet above the ground and both have spectacular views of the falls. One of the restaurants include a buffet and you can save yourself some money by opting for early diner specials. Diners get to go to the top of the tower and visit the viewing deck for free. However, if you aren’t interested in eating so high up, you can choose to just buy a ticket to the top. Children under 3 get in free and there are discounted tickets for kids from 3 to 12 years of age. 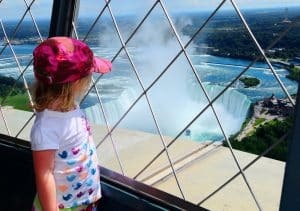 The Skylon Tower includes a 3-D/4-D thrilling movie theater that tells you all about the Falls and you can get more discounts by choosing a combo ticket for the Observation Deck and the 3-D/4-D movie. Plan the family-friendly vacation of a lifetime at Niagara Falls. Reserve a room at the Sheraton On The Falls to be right in the middle of all the action!